Cells perform many vital processes, such as respiration, movement, nutrition and reproduction. Cells get substances from the surrounding medium and get rid of wastes by expelling them to the surrounding medium. Cellulosic cell walls: these are permeable, as they allow both water and mineral ions to pass through. Cell walls covered with lignin, suberin, or cutin: these are impermeable to water and salts. Plasma membranes: these are semi-permeable (selectively permeable). They are thin with tiny pores that can control the passage of substances through them. Some substances may be allowed to pass freely, some may pass slowly and some cannot pass at all. The semi-permeable plasma membranes allow the passage of water and control the permeability of many salts, but prevent the permeability of sugars and amino acids because they are large-sized molecules. The movement of molecules through the membrane from a region of high concentration to a region of low concentration, which makes the concentration of molecules on both sides equal. For example, the exchange of carbon dioxide and oxygen gases between the inner and outer mediums of the cell during the respiration process. If the concentration of molecules in a cell is greater than that of the external medium, molecules move from the cell to the external medium to balance the concentration of both sides. Osmosis is the movement of pure water molecules through a membrane from a region of low concentration to a region of high concentration, which makes the concentration of both sides equal. Osmotic pressure is the pressure that causes the diffusion of water through semi-permeable membranes. It increases the concentration of solutes in the solution, i.e. a directly proportional relationship. 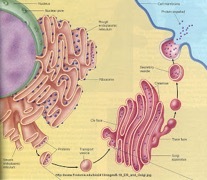 Water transports from and to the cells due to the difference between the concentration of cytoplasm (fluid inside the cell) and the external medium. 1- When we put cells in a solution of low concentration, water transports from the external medium (low concentration) into the cell (high concentration), which tears up cells. 2- When we put cells in a solution of equal concentration, water transports equally between the two mediums, and cells sizes don’t change. 3- When we put cells in a solution of higher concentration, water transports from the cell (low concentration) to the external medium (high concentration), which makes cells shrink. Facilitated transport is the transport of molecules through a membrane by means of a carrier protein (which carries molecules) where the cell doesn’t consume any energy. For example, glucose is transported to cells carried by carrier proteins. Active transport is the transport of big molecules and ions through the cell membrane against their concentration gradient (from low to high concentration) using energy. 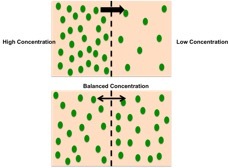 Active transport balance the concentration of ions inside cells. Active transport allows nerve cells to control the concentration of sodium and potassium ions in them, which allows them to send nerve impulses to muscle cells. This allows root cells to absorb the ions of soil salts (though the concentration of ions in these cells is lower than that of soil). 1- Exocytosis – transporting substances out of the cell through the plasma membrane. How does Exocytosis take place? 1- Golgi bodies store wastes in their vacuoles (Golgi vacuoles). 2- They move through cytoplasm to the plasma membrane to fuse with it. 3- They empty these wastes outside the cell. 2- Endocytosis – transporting substances to the cell through the plasma membrane. How does Endocytosis take place? 1- A part of the plasma membrane bends to surround the particle, forming a sac. 2- The sac containing the particle moves to the cytoplasm. If the solid substances enter the cell by means of endocytosis process, we call it a phagocytosis process. If liquid substances enter the cell by means of the endocytosis process, we call it a pinocytosis process. Solid particles, especially colloidal ones, have the ability to absorb liquids, swell, and increase in volume. For example, when a piece of wood is placed in water, it imbibes water. Imbibition extends through the piece of wood until it reaches the parts which are not submerged in water.